As the media landscape continues to evolve, consumers are now faced with a variety of options to customize their usage across radio, television and digital. 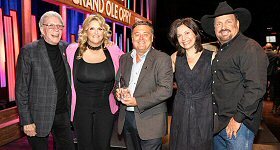 According to Nielsen's Total Audience Report for Q2, Adults 50-64 spend more overall time per day than any other group connected to media at 11 hours 49 minutes, including the most time on radio (2 hours 7 minutes). Younger consumers spend more of their time using TV-connected devices and digital platforms, while older demos are still the biggest consumers of linear television and radio. The report found that 92% of adults listen to radio during the average week, more than any platform. 19% of U.S. adults listen to podcasts each week and 24% of households own a smart speaker. Adults 18-34 spend more time on digital (44%) than TV and TV-connected devices (39%). However, regardless of age, radio consistently accounts for between 15-18% of daily media use. Podcasts are rapidly growing in popularity and now reach nearly one-fifth of U.S. adults weekly. While every individual has uniquely personalized media habits, some patterns emerge by race and ethnicity just as they do by age. Black adults spend 12 hours and 46 minutes per day on media, which is 23% more time than the average adult. 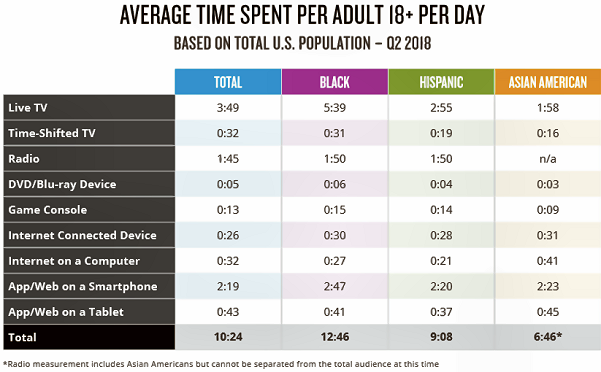 while Blacks spend over 3 and a half hours longer per day than Hispanic adults on media, Hispanics still over-index on radio, TV-connected device, and smartphone usage. Asian-American adults spend more time than any other group on computers and tablets, and also over-index on smartphone usage. Looking at primetime, or 9pm-midnight, radio is more closely tied to traditional business hours. Listening time peaks at 12pm but radio's share of total media time spent per hour is consistently at its highest between 7am and 5pm. Digital usage is also consistent for an even longer period of time throughout the day. There is less than a one minute fluctuation in time spent from 9am-9pm. From morning until night, the Internet is an integral part of people's lives. Digital share is at its lowest during the same 9pm-12am window in which TV and TV-connected device share of time spent is at an apex. Radio's share of time spent is highest at 7am (28%), and it remains greater than 20% throughout the day from 6am-4pm. In fact, if we only looked at weekdays, we would see increased shares of time spent with radio during commute and working hours. Among all age groups and dayparts, digital usage is highest at 2pm among adults 35-49 at just under 14 minutes. Radio peaks among 50-64 at 12pm with a listening time of 8 minutes 34 seconds. Adults 18-34 are the heaviest users of TV-connected devices, with their greatest amount of time spent occurring from 9-11pm with 5 minutes 51 seconds of usage. The Nielsen report also reveals that new technologies are also playing a role in how audio is consumed. Smart speakers can now be found in 24% of all households, up from 22% in Q1 2018. They are enhancing the in-home audio experience, but what are consumers listening to? According to the Q2 2018 Nielsen MediaTech Trender, a quarterly consumer tracking survey which concentrates on emerging technology devices and services, 90% of smart speaker users are listening to music, with half of that (45%) listening to podcasts or audiobooks.